Here are a couple of pics. I am almost finished. 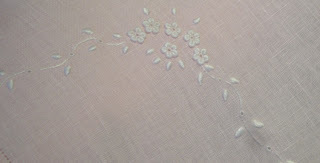 I was so glad to have the embroidery finished while I was on retreat, that I just had to wash it. The only thing I had to wash it with was shampoo. I wish I had taken a picture of it before. It is amazing what a bath and an iron can do for a piece. Note that the dark spot in the lower right hand corner must be from the camera, all of the pictures I took had it on there. That is something I am finding to amazing, the number of pictures you have to take in order to get some that work for you. A friend had told me that and I didn't have the experience that it was true. If you takes lots and lots of shots you will get some that work. 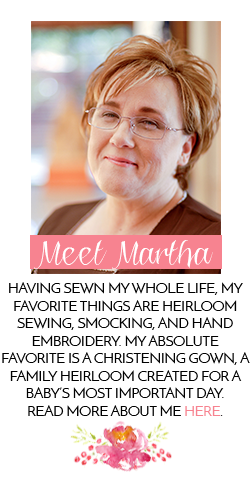 Martha - it's amazingly beautiful!! Thanks. I am anxious to get it sewn together. 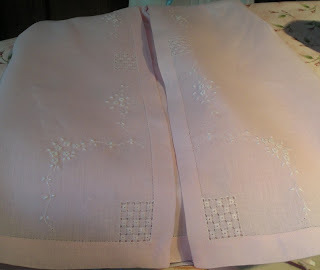 It is cool that when using one piece of linen after you get the embroidery and hemstitching done you are almost there. Maybe tomorrow I will get some time.